"If you call what we did a crime, we demand to serve our time"
- Sea Shepherd Land Team Leader, Rosie Kunneke of South Africa. What does a compassionate person do when convicted of a "crime" of compassion? What does a kind person do when convicted of a "crime" of kindness? What does a person of courage who defends the lives of innocents do, when convicted of the "crimes" of courage and saving lives? 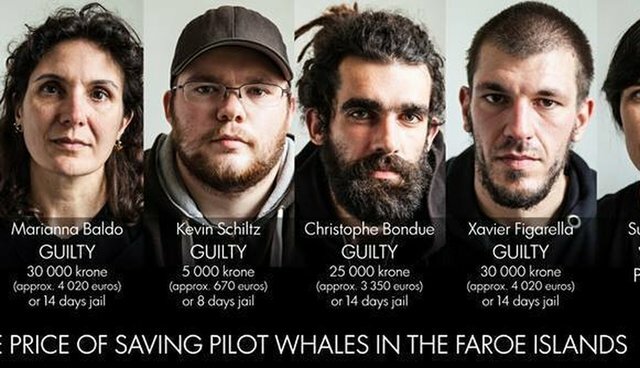 The five Sea Shepherd volunteers convicted this weekend for attempting to stop the horrific massacre of 253 pilot whales are demonstrating exactly what should be done in the face of an unjust and prejudiced Danish court system. Marianna Baldo of Italy, Christophe Bondue of Belgium, Xavier Figarella of Corsica/France and Kevin Schiltz of Luxembourg are all citizens of the European Union (EU) and the Grindadrap (the murder of whales) is illegal under the laws of the EU, and that means it is illegal under the laws of Denmark. So how is it that a Danish prosecutor can bring charges against European citizens in a Danish court before a Danish judge for attempting to oppose what is recognized as an illegal activity by the laws of the Danish Kingdom? Kevin Schiltz was charged with being on the beach where the Grind was taking place. There were hundreds of people on that beach so why was Kevin charged and no one else? Because Kevin was wearing a Sea Shepherd shirt and because he told the police that he could see that the whales were not being killed quickly. He could see the suffering of the pilot whales, the blood being splashed from the thrashing of their tails, and he could hear their screams. He did not disrupt the killing but he was a witness to an atrocity the police did not wish him to see. Yet, of all the hundreds of people on the beach, including non-Faroese tourists, only Kevin was charged and for his conviction the sentence is 5,000 Danish kroner (670 Euros, approx. $738) or eight days in jail. Kevin has no intention of paying the 5,000 kroner. He told the court he wishes to serve the time. Marianna Baldo and Xavier Figarella were in a small boat over a mile away from the slaughter on Vagur Island. Their intention was to film what they could from a distance. They were intercepted by the Danish naval Frigate Triton and arrested by the Danish Navy. They have been fined 30,000 kroner each (4,000€, approx. $4,428) or 14 days in jail. Their small boat, the tender for the Sea Shepherd vessel Brigitte Bardot, was ordered confiscated - despite the fact that the law states that property exceeding the value of the fine may not be confiscated. But in the Faroes, the law is merely a tool of harassment, not an implement of justice. Marianna and Xavier have no intention of paying this fine. They told the court they wish to serve the time in jail. Christophe Bondue of Belgium proudly admits to attempting to save the whales from the vicious knives of the Faroese killers. He was tackled by the Danish police, thrown to the ground and charged with disrupting the obscenity the Faroese call the "Grind." Christophe, despite being on the beach and despite actually trying to disrupt the slaughter, was fined less than Xavier and Marianna who were a mile away from the whales. His fine is 25,000 kroner (3,350€, approx. $3,691) or 14 days in jail. He told the court he has no intention of paying the fine and wishes to serve the 14 days in jail. Rosie Kunneke is from South Africa and she also was charged with attempting to disrupt the slaughter of the pilot whales. She was thrown to the ground by three policemen and charged with disrupting the slaughter. Her fine is the highest at 35,000 kroner (4,690€, approx. $5,167) or 14 days in jail. Rosie is demanding her right to serve her 14 days in jail. She said, "If you call what we did a crime, we demand to serve our time." But the wrath of the Danish court did not stop there. The court decided that some entity had to be responsible for the actions of the volunteers. Without any reason for doing so they decided that entity would be Sea Shepherd Global. No representatives from Sea Shepherd Global were even summoned to appear. Despite being denied the right of legal defense, Sea Shepherd Global was fined 75,000 kroner (10,000€, approx. $11,075). Sea Shepherd Global has no intention of paying this ludicrous fine. The defendants demanded the right to serve the whales in a Faroese jail. The Danish prosecutor, the overly zealous Linda Hesselberg, is now trying to deny them the honor of serving time for the whales. She is demanding immediate deportation. This of course has its upside because none of the fines will be paid, but it also reveals the entire verdict as a sham of justice. What's the point of a conviction and a sentence if there is no intention of allowing the convicted to serve their justly rewarded sentences? You see, all five defendants are proud of what they did. They are proud of their actions and they are proud of the verdicts. They want the right to demonstrate their commitment to those 253 whales that died, by having the honor of serving time on their behalf. And they resent this pro-whale killing Danish prosecutor's attempt to deprive them of that honor. The deaths of these whales should be marked by the sacrifice of those who are there to protect them. It is a mark of their commitment, a salute to those who died, a tribute to our respect for the family units that were so viciously and so thoughtlessly exterminated. What kind of a legal system denies the right of a convicted person to serve their sentence? But all this is being legally challenged by Sea Shepherd's lawyer. An appeal is being prepared against the sentences and against the possibility of deportation. How does Denmark, a member of the EU, deport four citizens of the EU for trying to uphold EU regulations? There is a rotten stench from the kangaroo court that can be smelt all the way to Copenhagen. This verdict was about Denmark sending a message to the whale killers that the Grind is 100 percent supported by the Kingdom of Denmark. The Danes can say whatever they wish but Danish complicity in this crime has been effectively demonstrated. What the court has achieved is to enable Sea Shepherd to send a message around the world that our resolve to end this cruel and needless slaughter has been strengthened. The Sea Shepherd volunteers desire to serve their time because they want to demonstrate that they are immensely proud to stand in the defense of such wondrous and beautiful sentient beings threatened by the barbaric harbingers of cruel and senseless death. If this verdict was meant to discourage opposition to the killings, it will have the opposite effect. Saving the lives of these gentle, self-aware, intelligent, sociable and sentient beings is worth the risks that these volunteers have undertaken - and when someone is willing to risk their life to defend life, a few days in jail is hardly a sacrifice. Perhaps what is needed is for the Faroese jails to be filled with people of conscience. The whales need people willing to accept the honor of imprisonment for taking a stand in defense of life. Eco-tourism seems to be popular these days but perhaps we need to exercise eco-tourism activism. Come to the Faroe Islands, save the whales and experience the hospitality of the Faroese jails. The new eco-tourism can be seen in the international volunteers now on the beaches of Costa Rica, Honduras and Florida defending sea turtle nests and hatchlings. It can be seen in the waters off the shore of Southern France where volunteer divers are removing destructive ghost nets. It can be seen at the cove in Taiji, Japan with the Cove Guardians and in the Sea of Cortez with people volunteering to save the endangered vaquita - and if need be it can be seen in a cell in the Faroe Islands where a person may peacefully contemplate their acts of compassion.